Severe Tropical Cyclone Yasi /ˈjɑːsiː/ was a powerful and destructive tropical cyclone that made landfall in northern Queensland, Australia in early 2011, causing major damage to the affected areas. Originating as a tropical low near Fiji on 26 January, the system intensified to tropical cyclone status during the evening of 30 January. Yasi deepened rapidly over the next 24 hours, and was classified as a Category 3 cyclone at about 5 PM AEST (07:00 UTC) on 31 January 2011. Late on 1 February, the cyclone strengthened to a Category 4 system; then, early on 2 February, the cyclone intensified into a Category 5 Severe Tropical Cyclone. The system had a well-defined eye and continued to track west-southwestward, maintaining a central pressure of 930 hPa (27 inHg) and a Dvorak intensity of T6.5 into the evening. At about 12:00 AM AEST (14:00 UTC) on February 3, Yasi crossed the Australian coastline as a Category 5 severe tropical cyclone near Mission Beach, with estimated maximum 3-second gusts of 285 km/h spanning an area from Ingham to Cairns. A record low pressure of 929 hPa (27.43 inHg) was measured as the eye passed over Tully. Due to the size of the system and its strong core, Yasi maintained cyclonic intensity farther inland than normal, finally dissipating into a tropical low near Mount Isa, at 10 PM on February 3, 2011, 22 hours after the storm first crossed the coast. The storm caused an estimated AU$3.5 billion (US $3.6 billion) in damage, making it the costliest tropical cyclone to hit Australia on record (not accounting for inflation; otherwise, Cyclone Tracy was costlier). Yasi was also indirectly responsible for the death of a 23-year-old man, who died from suffocation by generator exhaust fumes. Tropical Cyclone Yasi was the biggest storm in Queensland's history, with more than 10,000 people moved from their homes. The storm passed between the two big cities of Cairns and Townsville which only suffered minor damage. Early estimates of damage put the cost at about AU$100 million. It did not cause as much damage as government expected, as it missed major cities. It did however destroy 30% of the houses in Tully. At least 75% of the banana crop was destroyed, and damage to the sugar cane farms is expected to cost about AU$500 million. Damage to power lines left 150,000 homes without electricity. Tropical Disturbance 09F was first identified on 26 January 2011 by the Fiji Meteorological Service (FMS), while it was 330 km (205 mi) south-southwest of Tuvalu. Over a region of high sea surface temperatures and low to moderate wind shear, it was expected to intensify gradually as it moved southwest. Little development took place over the following two days, though it was classified as a tropical depression on 27 January. By 28 January, the depression was characterised as a poorly-developed low, with a broad area of rotating, flaring convection. Considerable development took place on the following day, prompting the Joint Typhoon Warning Center (JTWC) to issue a Tropical Cyclone Formation Alert. The storm's low-level circulation centre became increasingly defined and convective banding features were apparent along the northern periphery of the depression. It deepened rapidly throughout 30 January, resulting in the JTWC upgrading the system to a tropical storm after data from an ASCAT image depicted winds near gale-force around the storm's centre. Shortly thereafter, the FMS also upgraded the storm, classifying it as Tropical Cyclone Yasi. Upon being classified a tropical cyclone, Yasi was located about 370 km (230 mi) northeast of Vanuatu. Along the north edge of a strong subtropical ridge, the storm tracked generally westward, taking it through the northern islands of the country. Continuing to rapidly intensify, Yasi attained severe tropical cyclone intensity with ten-minute sustained winds of at least 120 km/h (75 mph) on 31 January, as the primary convective band wrapped around the storm's centre. Later that day, the storm crossed 160°E, prompting the final advisory from the FMS and the first advisory from the Australian Bureau of Meteorology, as the system crossed into the Australian cyclone basin. Severe Tropical Cyclone Yasi directly impacted the Solomon Islands, Vanuatu and parts of Australia, while parts of Fiji and Papua New Guniea were indirectly impacted. As a result of the system's impacts, the name Yasi was subsequently retired from the list of South Pacific tropical cyclone names and replaced with Yvone. Between January 23–30, strong winds and swells were observed in Tuvalu, as Tropical Cyclones Wilma and Yasi developed and passed. These strong winds delayed shipping schedules and affected students studying in Vaitupu and Fiji, and outer islands ran out of fresh supplies as a result of rough seas. During 28 - 30 January, Yasi's precursor tropical depression caused rain and strong winds over the Fijian islands off Rotuma, Vanua Levu, Taveuni and the northern Yasawa Islands. During January 30, Yasi became the second of three systems to directly impact Vanuatu in two months. Tropical Cyclone Yasi moved across Vanuatu's northern Torba Province, with winds reaching up to 95 km/h (60 mph). Vanuatuan officials reported difficulties making contact with the Torba Province, but it was believed that the northern area escaped major damage. The storm was several hundred kilometres southeast of Papua New Guinea, but the outer edges of the large system brought strong winds, high seas and heavy rain to the country. In Milne Bay Province, local officials advised residents living along the coast to move to higher grounds. As Yasi moved into the Australian region meteorological data from the weather station on Willis Island was used to help monitor the system. Ahead of the system impacting the island, staff battened down the buildings and were evacuated off the island by a helicopter during 1 February. Yasi subsequently passed directly over the weather station during 2 February, where wind gusts of 185 km/h (115 mph) and a minimum pressure of 937.9 hPa (27.70 inHg) were recorded, before the meteorological equipment and communications failed. After the system passed over the island, it became clear that the strong winds and storm surge had damaged the radar, key observing systems as well as communications, operational and life support infrastructure. It was also noted that the system had altered the shape of the island and cleared most of its vegetation. Most of the automated surface observing systems and communications were subsequently restored and became operational, fifteen days after Yasi had passed over the island. However, the radar and life-supporting systems took a bit longer to restore and were subsequently completed by the end of November, before staff returned to the island during December 2011. By the time Yasi crossed into Australian basin, preparations for the storm were under way. Media outlets referred to the storm as "what could be the state's worst cyclone in history". Because of its great size, many feared that the tropical cyclone could cause damage more severe than Cyclone Larry in 2006 or Cyclone Tracy, which severely damaged Darwin in 1974. Thousands of residents in the path of the storm were urged to evacuate by Queensland Premier Anna Bligh. Thirty thousand people were evacuated from Cairns, including all patients from Cairns Base Hospital and Cairns Private Hospital who were airlifted by the Royal Australian Air Force and other agencies (such as the Royal Flying Doctor Service) to Brisbane. The Queensland state emergency coordinator warned residents that they would be on their own for up to 24 hours, as the conditions would be too dangerous for emergency responders. Waves as high as 12 m (39.37 ft) were predicted to hit the north Queensland coast as the storm surge caused by Cyclone Yasi combined with a high tide of up to 7 m (23 ft) above average. In Mission Beach near where Cyclone Yasi made landfall, wind gusts were estimated to have reached 290 km/h (180 mph), leaving behind much damage. A storm surge estimated to have reached 7 m (23 ft) destroyed several structures along the coast and pushed up to 300 m (980 ft) inland. In the hours after the storm's passage, police could not venture beyond their station grounds as the situation had yet to be declared safe. Most of the beach had lost its sand and every structure was damaged to some degree. Near sunrise on 3 February, there were no reports of fatalities or injuries in Mission Beach. As the eye of the storm moved over several towns in Queensland, news reporters took the opportunity to give brief damage assessments before the eyewall returned. The worst affected areas were around Tully, Tully Heads, Silkwood, Mission Beach, Innisfail and Cardwell. According to residents in Tully, the town was "...a scene of mass devastation". An unknown number of homes were completely destroyed as intense winds, estimated at 209 km/h (130 mph), battered the area. Many other homes not destroyed sustained severe facade and or roof damage. As daybreak came, reports from the town stated that about 90% of the structures along the main avenue sustained extensive damage. An evacuation centre in Innisfail began to flood as the worst of Yasi's impacts neared. Evacuees were reportedly hammering boards at the bottom of doors to prevent water from further entering the structure. Additionally, concerns over the building's windows came about as they flexed amidst winds over 200 km/h (120 mph). In Townsville, numerous roofs were torn off buildings and sent hurtling down streets. Many windows are believed to have been broken as residents reported the sound of glass breaking throughout the night as the storm moved through. In Tully, the high school was destroyed and will need to be rebuilt. Numerous emergency calls were made by residents trapped in their homes near the height of the storm. However, their calls could not be acted upon as conditions were too dangerous for police to travel in. One reported instance was of six people trapped in an apartment complex at Port Hinchinbrook near Cardwell, who could not be evacuated. The building was threatened by Yasi's storm surge which exceeded 3 m (9.8 ft). The group were later reported to be safe. Around 10:30 pm local time on 2 February, Premier Bligh stated that an estimated 90,000 structures, including evacuation centres, were without power. This figure rose to 170,000 by morning and officials stated that some residents may be without power for more than a month. The water-supply system had failed in Townsville and there was only 24 hours supply, while the water had run out at Magnetic Island in one day. Fears of total devastation to the banana and sugar cane crops arose as the storm struck land. Initial estimates stated that damage to sugar cane alone could reach A$505 million. On 3 February, total losses from the storm were estimated to reach A$3.5 billion ($3.54 billion USD), this makes it the costliest cyclone to ever hit Australia (not accounting for inflation). By 5 February, A$2 billion ($2.03 billion USD) was confirmed to have been lost in agriculture, mining and local government. An additional A$1 billion has been lost in the tourism industry. One death was due to carbon monoxide poisoning by exhaust of a portable generator being used in a confined space at Bambaroo near Ingham. Two days after landfall, severe flooding from the rains severed the Bruce Highway between Townsville and Ingham leaving a 10 kilometre backup of traffic. Many of those who evacuated the devastated areas including emergency workers were stranded. On 5 February, the remnants of Yasi as a tropical low created torrential rain as rainfall of 140 mm (5.5 in) was recorded in Terowie and Yongala. Flooding was widespread in towns of northern South Australia reaching even Renmark on the River Murray. In north-west Victoria, Mildura recorded the highest daily rainfall total on record, with 142 mm (5.6 in) and Lyndhurst, a suburb of Melbourne recorded 180 mm (7.1 in) of rain in the 24 hours falling up to 9am AEDT (22:00 UTC) on the 5 February. On 6 February, the BOM reported that Ex-Tropical Cyclone Yasi was 85 km (53 mi) north of Yulara and that heavy rains continued in the Alice Springs area. The deluge also continued in northern South Australia as vast areas continued to get rain. Hallett had a record rainfall amount of 98 mm (3.9 in). Damaging winds with gusts of more than 90 km/h hit Marla and Coober Pedy. More than 100 mm (3.9 in) also fell at Arkaroola and Mt Dare, 92 mm (3.6 in) fell at Marree, and 86 mm (3.4 in) at Yunta. Even one week after the flooding rains, areas that were affected had become completely isolated. At Challenger Gold Mine 150 people were isolated and emergency supplies had to be flown in. Cattle Stations near Oodnadatta, Glendambo and the world's largest at Anna Creek Station were all isolated. The Australian Defence Force (ADF) response was designated Operation Yasi Assist. The ADF established Joint Task Force 664, based at Lavarack Barracks in Townsville and under the command of Brigadier Stuart Smith, for operational command on 2 February 2011. ^ "Qld prepares for 'most savage' cyclone". The Sydney Morning Herald. Fairfax Media. Australian Associated Press. 31 January 2011. Retrieved 1 February 2011. ^ "Tropical Cyclone Advice No. 9". Bureau of Meteorology. Australian Government. 1 February 2011. Retrieved 1 February 2011. ^ "Tropical Cyclone Advice Number 21". Bureau of Meteorology. Australian Government. 2 February 2011. Retrieved 2 February 2011. ^ "Tropical Cyclone Technical Bulletin". Bureau of Meteorology. Australian Government. 2 February 2011. Retrieved 2 February 2011. ^ "TROPICAL CYCLONE Threat Map". Bureau of Meteorology. Australian Government. 2 February 2011. Retrieved 2 February 2011. ^ "Severe Tropical Cyclone Yasi". Bureau of Meteorology. Australian Government. February 2011. Retrieved 8 November 2016. ^ "Cyclone Yasi to cost insurers A$3.5 billion - forecaster". Reuters. 3 February 2011. Retrieved 5 November 2011. ^ "Man in cyclone zone suffocates". Sydney Morning Herald. 4 February 2011. Retrieved 6 February 2011. ^ "Tropical Disturbance Summary". Fiji Meteorological Service. 26 January 2011. Archived from the original on 26 January 2011. Retrieved 1 February 2011. ^ "Tropical Disturbance Summary". Fiji Meteorological Service. 27 January 2011. Archived from the original on 27 January 2011. Retrieved 1 February 2011. ^ Joint Typhoon Warning Centre (28 January 2011). "Significant Tropical Weather Advisory for the Western and South Pacific Oceans". United States Navy. Archived from the original on 28 January 2011. Retrieved 1 February 2011. ^ Joint Typhoon Warning Centre (29 January 2011). "Tropical Cyclone Formation Alert". United States Navy. Archived from the original on 29 January 2011. Retrieved 1 February 2011. ^ Joint Typhoon Warning Center (30 January 2011). "Tropical Storm 11P Advisory 001". United States Navy. Archived from the original on 30 January 2011. Retrieved 8 October 2017. ^ a b "Tropical Disturbance Advisory Number A4". Fiji Meteorological Service. 30 January 2011. Archived from the original on 30 January 2011. Retrieved 1 February 2011. ^ Joint Typhoon Warning Center (30 January 2011). "Tropical Storm 11P Advisory 002". United States Navy. Archived from the original on 30 January 2011. Retrieved 1 February 2011. ^ "Tropical Disturbance Advisory Number A7". Fiji Meteorological Service. 31 January 2011. Archived from the original on 30 January 2011. Retrieved 1 February 2011. ^ "Hurricane Warning 092". Fiji Meteorological Service. 31 January 2011. Archived from the original on 31 January 2011. Retrieved 1 February 2011. ^ RA V Tropical Cyclone Committee (11 October 2018). Tropical Cyclone Operational Plan for the South-East Indian Ocean and the Southern Pacific Ocean 2018 (PDF) (Report). World Meteorological Organization. pp. I–4&nbsp, – II–9 (9–21). Archived from the original on 12 October 2018. Retrieved 12 October 2018. ^ Severe Weather Forecasting and Disaster Risk Reduction Full Demonstration Project (SWFDDP) Region Sub Project RA V Progress Report Number 1: For the period 1 October 2010 – 28 February 2011 (PDF) (Report). World Meteorological Organization. 17 May 2011. Archived (PDF) from the original on 18 January 2018. Retrieved 18 January 2018. ^ a b Vulnerability profile of Tuvalu (Report). United Nations Conference on Trade and Development. March 2012. Archived from the original (PDF) on 8 July 2012. Retrieved 17 January 2018. ^ Climate Services Division (19 June 2012). Fiji Annual Climate Summary: 2011 (Report). Fiji Meteorological Service. Archived from the original (PDF) on 8 July 2012. Retrieved 17 January 2018. ^ "Cyclone Yasi moves towards Australia". Radio New Zealand International. 31 January 2011. Retrieved 3 February 2011. ^ "Solomon Islands and Vanuatu appear to have avoided the worst of Cyclone Yasi". Radio New Zealand International. 2 February 2011. Retrieved 3 February 2011. ^ Staff writer (31 January 2011). "PNG, Solomons alert for cyclone bhYasi". Radio Australia. Australian Broadcasting Corporation. Archived from the original on 5 February 2011. Retrieved 1 February 2011. ^ a b "Monster cyclone knocks out weather radar". Australian Broadcasting Corporation. 2 February 2011. Archived from the original on 18 January 2018. Retrieved 18 January 2018. ^ "Back to business for Willis Island weather station" (Press release). Australian Bureau of Meteorology. 12 December 2011. Archived from the original on 18 January 2018. ^ Stolz, Greg; Williams, Brian; Michael, Peter (1 February 2011). "'Potentially very deadly event' as Cyclone Yasi bears down on Queensland". The Daily Telegraph. News Limited. Retrieved 1 February 2011. ^ Malkin, Bonnie (31 January 2011). "Still reeling from flooding, Queensland braces for worst ever storm". The Daily Telegraph. Telegraph Media Group Limited. Archived from the original on 31 January 2011. Retrieved 31 January 2011. ^ Newborn, Jaime (31 January 2011). "Premier: Get out before Yasi hits". Daily Mercury. Archived from the original on 31 January 2011. Retrieved 31 January 2011. ^ a b Madigan, Michael; Munro O'Brien, Jodie (2 February 2011). "30,000 evacuated from Cairns as city braces for a pounding from Cyclone Yasi". The Courier-Mail. News Limited. Retrieved 2 February 2011. ^ "Queenslanders told to stay put as Yasi closes in". ABC Asia Pacific News. Australian Broadcasting Corporation. 2 February 2011. Retrieved 2 February 2011. ^ Nancarrow, Dan (2 February 2011). "Waves 12m high to lash coast". Brisbane Times. Fairfax Media. Retrieved 2 February 2011. ^ a b "Yasi unleashing fury on Qld coast". The Sydney Morning Herald. 2 February 2011. Archived from the original on 2 February 2011. Retrieved 2 February 2011. ^ Michael, Peter (3 February 2011). "Morning heralds the big clean-up". Herald Sun. Archived from the original on 3 February 2011. Retrieved 3 February 2011. ^ Berry, Petrina (3 February 2011). "Damage extensive in Mission Beach". The Sydney Morning Herald. Australian Associated Press. Archived from the original on 2 February 2011. Retrieved 3 February 2011. ^ "Despair and relief in cyclone's wake". ABC News. 3 February 2010. ^ Schwarten, Evan (2 February 2011). "Tully a scene of mass devastation". Australian Associated Press. The Sydney Morning Herald. Archived from the original on 2 February 2011. Retrieved 2 February 2011. ^ ONE News (3 February 2011). "Yasi wreaks havoc but no fatalities". TVNZ. Archived from the original on 2 February 2011. Retrieved 3 February 2011. ^ Australian Associated Press (2 February 2011). "Windows flex, water rushes into safe haven". The Sydney Morning Herald. Archived from the original on 2 February 2011. Retrieved 2 February 2011. ^ Australian Associated Press (2 February 2011). "Sheets of roof torn from shopping centre". News.au. Archived from the original on 2 February 2011. Retrieved 2 February 2011. ^ Packham, Laura (7 February 2011). "Cyclone Yasi destroys Tully High School". The Cairns Post. Archived from the original on 7 February 2011. Retrieved 7 February 2011. ^ "Six confirmed safe at Port Hinchinbrook". ABC News. 3 February 2011. Retrieved 3 February 2011. ^ Nancarrow, Dan (3 February 2011). "Power down for weeks after Yasi". The Sydney Morning Herald. Archived from the original on 2 February 2011. Retrieved 3 February 2011. ^ Wright, Tony (4 February 2011). "Surviving a night in the depths of hell". The Age. Archived from the original on 3 February 2011. Retrieved 4 February 2011. ^ "Sugar price soars on US markets as Cyclone Yasi hits Queensland". Herald Sun. 3 February 2011. Archived from the original on 2 February 2011. Retrieved 3 February 2011. ^ "Cyclone Yasi to cost insurers A$3.5 bln — forecaster". Reuters. 3 February 2011. Archived from the original on 3 February 2011. Retrieved 3 February 2011. ^ Andrew Fraser (5 February 2011). "Damages from Yasi to dwarf Larry's costs". The Australian. Retrieved 5 February 2011. ^ Geoffrey Rogow (5 February 2011). "Australia Assesses Damage After Cyclone". The Wall Street Journal. Archived from the original on 5 February 2011. Retrieved 5 February 2011. ^ Staff writers (4 February 2011). "Cyclone Yasi claims first victim". The Age. Archived from the original on 3 February 2011. Retrieved 4 February 2011. ^ a b Wright, Tony (5 February 2011). "Surging floodwaters leave desperate families stranded on the road home". Brisbane Times. Archived from the original on 4 February 2011. Retrieved 5 February 2011. ^ a b Watkins, Emily; Mennie, Sarah (6 February 2011). "Yasi-bred storms hit southern states". The Sunday Mail. Adelaide Now. Archived from the original on 5 February 2011. Retrieved 6 February 2011. ^ Craig, Natalie (6 February 2011). "Bad luck and Yasi's tail behind the drenching". The Age. Archived from the original on 5 February 2011. Retrieved 6 February 2011. ^ "Issued at 11:00 pm CST Sunday 6 February 2011. SEVERE WEATHER WARNING for Flash flooding for people in the Alice Springs District". Bureau of Meteorology, Darwin. 6 February 2011. Archived from the original on 6 February 2011. Retrieved 6 February 2011. ^ a b c d Ken, McGregor (7 February 2011). "Desert rain records washed away". Adelaide Now. The Advertiser. Archived from the original on 6 February 2011. Retrieved 7 February 2011. ^ a b Mennie, Sarah (13 February 2011). "Outback flooding isolates hundreds". The Sunday Mail. Adelaide Now. Archived from the original on 12 February 2011. Retrieved 13 February 2011. ^ "Defence forms joint cyclone taskforce". AAP/News. 2 February 2011. 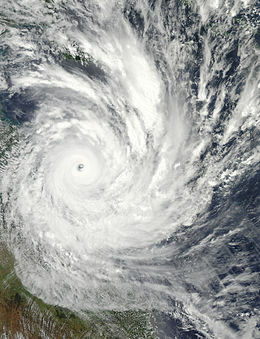 Wikimedia Commons has media related to Cyclone Yasi (2011).